The battleground hasn’t expanded – it’s still being played on Obama’s turf … But the focus has narrowed to four states this week – Iowa, Virginia, Ohio, and Colorado … Team Romney maintains 2-to-1 spending edge … Activist conservatives still don’t trust Romney – just look at how they pounced yesterday … Is Romney embracing “RomneyCare” again … The spiral campaign: Sandra Fluke introduces Obama, Romney invokes Pope John Paul II in an ad -- it’s birth control vs. religious freedom again. … Conservative intelligentsia continues to push Ryan for veep. 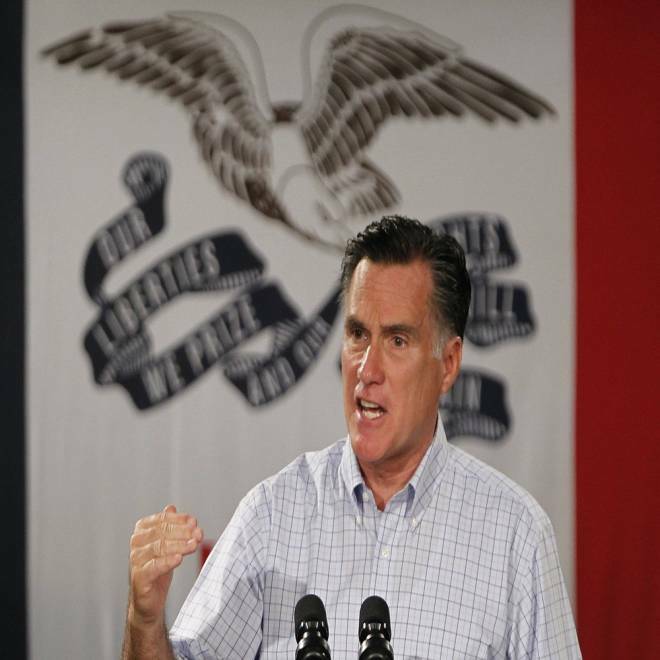 Republican presidential candidate and former Massachusetts Governor Mitt Romney speaks to supporters during a campaign event at Central Campus High School in Des Moines, Iowa August 8, 2012. *** Romney hasn’t expanded the map: Here we are in August and what the Obama campaign, at the beginning of all this, said would be the battleground states are the battleground states. They are not what the Romney camp said and hoped it would be, expanding to places like Pennsylvania and Minnesota (and Michigan and Wisconsin still look like reaches). Look at the four states where the campaigns are advertising most heavily this week (by points) – Colorado, Ohio, Virginia, and Iowa. All four are states George W. Bush and Barack Obama carried. And just one of those is a state Al Gore carried (Iowa). The point is: just four years ago, these were all places Republicans had traditionally been favored in. Yes, it speaks to polarization and a demographically divided America. But this is one reason why Romney’s perceived to be slightly behind – because he hasn’t expanded the playing field. Now, Obama’s defending in all these states, but he’s just not playing defense enough or in any other places. There has been advertising in just 11 states this election, now it’s really only just about eight -- with none or very little in Pennsylvania, Wisconsin, and Michigan. NBC's Domenico Montanaro highlight this week's top television ad markets and the new controversy over an old topic, birth control and religion. The reason why this week's ad spending wasn't as high as we originally assumed: The Crossroads GPS buy is ending (just as AFP goes up) and the Obama camp isn't spending as much as it did last week. That’s just four states, including three markets each in Iowa and Ohio and two each in Virginia and Colorado. By the way, don’t ignore the wind tax credit story (Romney’s against it). It’s a big deal in Iowa and Colorado. It’s been picked up now by the New York Times, AP, Wall Street Journal, National Journal, and began with the Des Moines Register and been noted by the Denver Post. It’s a sleeper local issue that has Republicans pushing back against Romney’s stance of wanting to eliminate the “production tax credit” because, they say, it would cost jobs. *** Ready to pounce: If you needed more proof that the activist base of the Republican Party just doesn’t inherently trust Mitt Romney, look no further than how ready to pounce they were yesterday to a comment made by a spokesperson and not even the candidate. The comment that sparked the outrage was from Andrea Saul talking about the Priorities ad that goes so far as to link Romney to a woman who died from cancer. “[I]f people had been in Massachusetts, under Gov. Romney's health care plan, they would have had health care,” she said. Just that comment alone prompted the likes of Ann Coulter to call for her firing on Laura Ingraham’s show. Ingraham herself posted that Saul “wins the ‘Etch-A-Sketch’ Award of the Day.” Red State’s Erick Erickson wrote a blog post entitled: "The Moment All the Doubts About Romney Resurfaced on the Right." “Consider the scab picked, the wound opened, and the distrust trickling out again,” he wrote. And Rush Limbaugh took to the airwaves in disbelief, calling the comments a “potential gold mine for Obama supporters.” The activist base just never gives Romney the benefit of the doubt – despite how much Romney has tried to do in lining up with their positions over the past several years. And remember, Romney hasn’t distanced himself from the Massachusetts health law; he just says it isn’t right for country (now). *** But was this a coincidence or something else? But has Romney’s tone shifted a bit on health care. It just so happened that coinciding with the “comment that sparked outrage around the conservative blogosphere,” was Romney talking favorably about “RomneyCare.” While the focus of Romney’s day was once again pushing his welfare charge against the president, Romney also said this yesterday in Iowa: “We've got to do some reforms in health care, and I have some experience doing that, as you know, and I know how to make a better setting than the one we have in health care. I want to make sure that those who have pre-existing conditions are able to get insurance, that people don't have to worry about being dropped from their insurance coverage, and that health insurance is available to all people. And I want to bring the cost of health care down - the cost of health care." As NBC’s Garrett Haake notes, this is much more than the zero mention he usually gives to “RomneyCare.” But we ask this: Would it really be a surprise if Romney tried to defend this a little bit more, especially with Romney so far behind with women. *** Veepstakes watch – the Ryan buzz continues in GOP circles: Everyone’s still waiting to see if Romney makes the pick before his bus tour (less likely), during the bus tour (possible, not probable), or afterward in run up to the convention (most likely). We reported yesterday that Paul Ryan is in the final three and the Ryan buzz continues today in GOP circles with the influential conservative Wall Street Journal editorial page today writing: “Why Not Paul Ryan?” Here’s Rich Lowry in Politico: “This is the broader point. Romney has to carry the argument to President Barack Obama. The state of the economy alone isn’t enough to convince people that Romney has better ideas to create jobs. Neither is his résumé. Romney needs to make the case for his program, and perhaps no one is better suited to contribute to this effort than Ryan.” As NBCNews.com’s Michael O’Brien notes: “It’s not just the media haranguing Romney for more detail. It’s conservatives, too. There’s a school of thought led by the Ryans and Walkers of the world that believe the only way to run a campaign is to offer a clear, understandable alternative, and stand up for it.” Whether Ryan and his budget plan is the way to win over swing voters or older voters in Florida, though, is another question. *** Obama remains in Colorado, Romney raises money: President Obama is in Colorado for two more events today -- in Pueblo at 12:40 pm ET and Colorado Springs at 5:15 pm ET. Romney holds a breakfast fundraiser in New York City.